Mouse acceleration is something most Mac users don’t think twice about, many aren’t aware it even exists. By default the mouse drivers count the movement of your mouse and depending on your sensitivity settings, the cursor will then move across the screen by a similar and consistent distance. 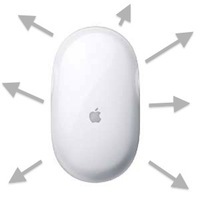 Mouse acceleration is basically a threshold setting on top of this, so when the mouse is moved past a certain point or at a certain speed, the cursor itself moves more quickly and goes further, thus accelerating the movement speed and rate of the mouse cursor. Hit return for the mouse scale to change, then log out and in or reboot for it to take effect. You can technically change the scaling number to just about anything you want by adjusting the number on the end. You typically need to log out and back in for the change to take effect. Another alternative is a little script written by chrisk called “killmouseaccel”, it runs on a Mac and disables mouse acceleration while it’s running, and a reboot turns it off and on. Learn more about the script to disable Mac OS X mouse acceleration via the command line here. This easy to use script will completely disable mouse acceleration in Mac OS X. Settings are reversible by rebooting the machine. This is a favorite for Windows gamers. For users who want precise control of mouse acceleration on Mac, you can download a free pref panel to enable such a feature. Mouse Acceleration preference pane is here – you can manually adjust or disable the mouse acceleration via this preference pane in Mac OS X, this is handy if you want to manually adjust the curve rather than just disable it. If you are looking for just instant changes and turning it off, I would recommend the command line methods, if you want precise control over the acceleration curve the preference pane is very useful. Why do people dislike mouse acceleration? Many new Mac users aren’t used to mouse acceleration, or the higher curve that Mac OS X’s acceleration provides compared to Windows. Mouse acceleration can cause a loss of cursor precision, particularly when trying to draw with the cursor in certain applications, or more commonly in gaming. The most common mouse acceleration complaints come from the gaming world, where the acceleration curve can lead to unanticipated mouse movements in games like Team Fortress 2 and Starcraft 2 , amongst many others. Personally I don’t mind mouse acceleration at all, but I have used Macs for a long time so the curve does not feel foreign to me. Many Mac switchers from the Windows world come to Mac OS X and find the cursor feels funny and more responsive, these are generally the people who would want to tweak the curve or disable the feature. For the record, mouse acceleration does exist in Windows it’s just at a different threshold and sensitivity. A GREAT hint would be: “What are the windows acceleration settings needed to match MacOS?” When I use BootCamp to boot windows the mouse feels slow and irritating. Just completely disable mouse acceleration, it’s much more precise. Mouse acceleration in the OS is fine/bearable and we can get used to it. BUT, in games it’s really weird and unpractical. (None of the methods you mentioned gives a Windows-like mouse acceleration). Ho do I cancel this “defaults write .GlobalPreferences com.apple.mouse.scaling -1” Command ? I’m not convinced that the value the author talks about under .GlobalPreferences has to do with the acceleration at all. If you change the tracking speed this value changes proportional. Maybe OS X just links them somehow but even if so this is still a problem as the link goes both ways and setting this to -1 leads to an intolerably slow tracking speed. My personal opinion is that mouse acceleration decreased my presicion. My first tought when I plugged a mice into my MacBook was that it was unresponsive, while it felt way more natural when using the trackpad. Regardless, thanks for this great article! I wish there were a program somewhere that would mimic the Windows acceleration curve exactly. I have tried MouseFix and a bunch of other stuff, and none of it works. It’s very annoying because I have to shift back and forth between a Mac and a PC and you can’t just “get used to” the different curve if you have to do that. It also makes graphics programs very difficult to use. If anyone finds a program that exactly mimics the Windows curve, please email me! Thank you! “find the cursor feels funny and more responsive”… Yeah right. It’s like a reflex game trying to get the pointer to where you want it. If you don’t scroll quickly, the cursor almost doesn’t move at all, but cross an invisible quickness threshold and the cursor vanishes into the distance. As I move the mouse right now, it moves with little fits and jumps even though I’m trying my hardest to keep it steady. How, exactly, does one go about changing the defaults in Terminal? I mean, I see that you have supplied the code. But is it simply a matter of opening Terminal, inserting your cursor in the little gray box area, pasting the code and hitting return? Or is there something more to it? Yep, that is all there is to it. I switched to mac about 5 years ago and still can’t get used to the way the mouse works. It’s not the acceleration or sensitivity, it’s the stupid curve that apple uses and I’ve never found an effective way to change it. This totally ruined my mouse/Sense/something. how can i reverse it? Hi I have this on my mac and love it. My issue is whenever I restart my machine I have to click on the settings to get it to work again. I have ticked the box saying enable at startup but it doesn’t start when I turn on my mac? Mouse acceleration has been my biggest enemy for years. It’s fine on a laptop or anything small, but I have a three monitor setup that spans almost two metres wide. Default mouse acceleration makes me feel like a retard every time I try to hit something precisely, or I need to set the speed so slow that I need half a meter of desk space to move the cursor from left to right on these screens. I do graphic design, illustration and drafting. I tried for years to get used to the “Mac” way, but never managed to adapt on that regard. I have addressed the issues in the past by using a Wacom mouse on an Intuos tablet. I worked, but their mouse has a life expectancy of about a year. It ends up being a stupidly expensive and frustrating solution, just to kill the mouse acceleration. 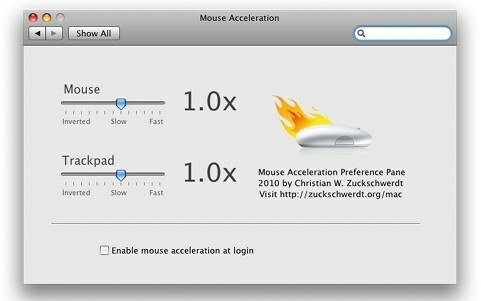 “Mouse Acceleration for OS X” just fixed the issue for me. The software works on Mojave. I have tried a lot but this one works like wonder. fully feel like windows if that is what you going for. and fine tweak about acceleration as well. also macro function and profile.